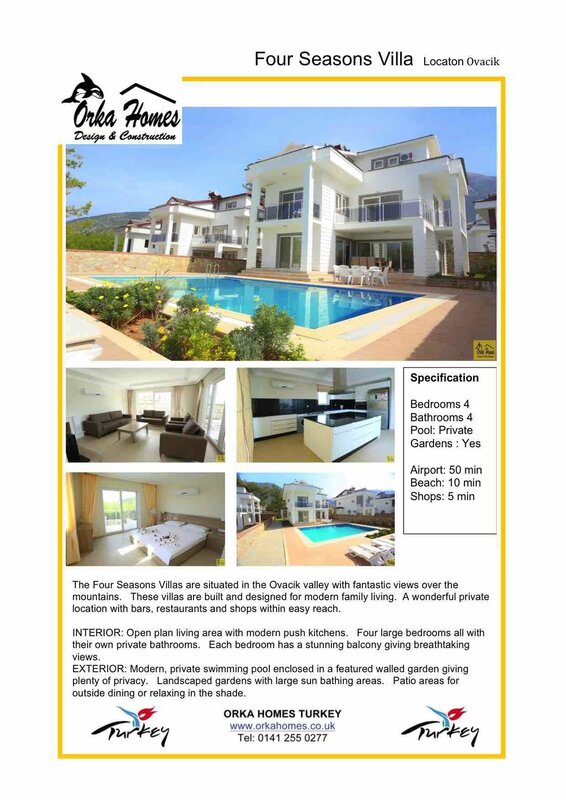 The Four Seasons Villas are a terrific property for sale in fethiye with its location in the Ovacik valley with fantastic views to the Babadag Mountains. These villas have been built for modern family living as either a permanent home or for holidays. A wonderful private location with bars, restaurants and shops within a easy few minutes walk. Four large bedrooms all with their own private bathrooms. Each bedroom has a stunning balcony giving breathtaking views. EXTERIOR: Modern, private swimming pool enclosed in a featured walled garden giving plenty of privacy. Landscaped gardens with large sun bathing areas. Patio areas for outside dining or relaxing in the shade. Just with a few minutes walk you will all the local bars, restaurants and shops and with Fethiye town only a 10 min bus ride away you will have a huge variety of shops and markets to choose from. The perfect property in fethiye for sale as either a holiday home or for permanent living.